Parks And Recreation: "Fancy Party"
Tonight's episode was pretty much an Xbox pancake all around. Parks & Rec's razor-sharp focus on solid character work makes the biggest plot developments seem totally believable, like the time Chris broke up with Ann without Ann even realizing what had happened. It's outrageous, yes, but it's the kind of thing that makes total sense for someone as relentlessly upbeat as Chris. So when April and Andy announced to Leslie that one month into their relationship, they were going to get married (to each other), I trusted the show would produce 1.) a very real wedding, and 2.) the eventual understanding among all the characters that the wedding was for the best. There isn't much overthinking of, really, anything in "Fancy Party." It starts when Ron complains of a toothache in the morning meeting, procures a pair of pliers and yanks out his Ron-freakin'-Swanson tooth and Tom faints all girly like. It wasn't hard for Ron to fathom how this would go down; he went to the dentist the day before, his tooth was gone, and he immediately knew of the joke he wanted to play. Later, Ann winds up at a local bar for singles night (surrounded by gaggles of singles that, let's face it, wouldn't be found anywhere near central Indiana under any other circumstances) and endures fumbles so painful she might as well be Nell. You know, from the movie Nell. Donna takes Ann under her no-nonsense, Jameson-soaked wing, and Ann quickly learns the value of going with her gut—or, as the case may be, ovaries. And though it's not much of the episode, the tension between Ben and Leslie, over whether or not Ben should leave Pawnee for a promising job, is an eventual triumph for simply doing what feels right. No, they don't get together, nor did I expect them to. Leslie, of course, is still the kind of woman who writes pro/con lists for even minor decisions. She has plenty of qualms about what April and Andy are doing, and she shares them for part of the episode. But then she just… stops. A solid half of the episode involves Leslie only sharing doubts to the camera; she accepts that the wedding is real and that Chris is going to deprive the entire party of cake with his vegetable loaf monstrosity. This is definitely a change from the higher-strung Leslie of yesteryear, which goes to show that not only are Parks & Rec's characters interesting to watch pretty much always, but they also learn from their mistakes. At one point during "Fancy Party," Ron warns Leslie not to meddle into things that aren't her business, and the way he points over to Andy and April is so casual and specific, that it indicates he's repeating advice he's given before. Not everything has to change though. I like that no matter when he appears, Jean-Ralphio is always the kind of guy that Dave Matthews Band haters talk about despising (and oddly it's not usually Dave Matthews or his music). His advice about a wedding speech isn't just to use a Vince Vaughn quote, it's to use a Vince Vaughn quote from Fred Claus—arguably even douchier for the relative obscurity. Plus Ron might have a sweet and sensitive side, but he also burns effigies of his ex-wives and has very specific rules about how to best burn effigies of ex-wives. And there's Jerry and his shirt. Oh, Jerry. 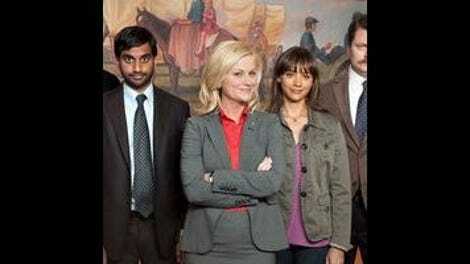 Truly, I don't think I've ever watched an episode of Parks & Rec without feeling great at the end. The video Andy and April send to the office is not only earnest, but it's freakin' April being earnest. Gets me every time. Andy Dwyer: Big heart, little thinking. Yet another perfect match: Chris talking to that creepy guy. "The wedding is in four minutes." 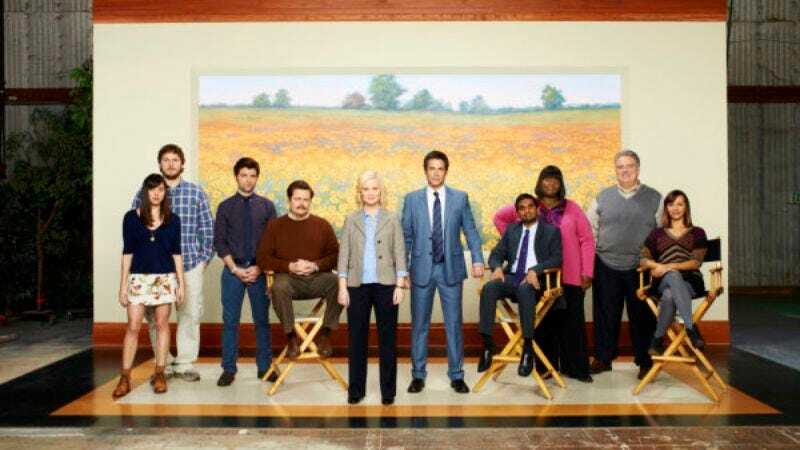 Parks And Recreation: "The Fight"/"Road Trip"
Parks And Recreation: "Jerry&apos;s Painting"